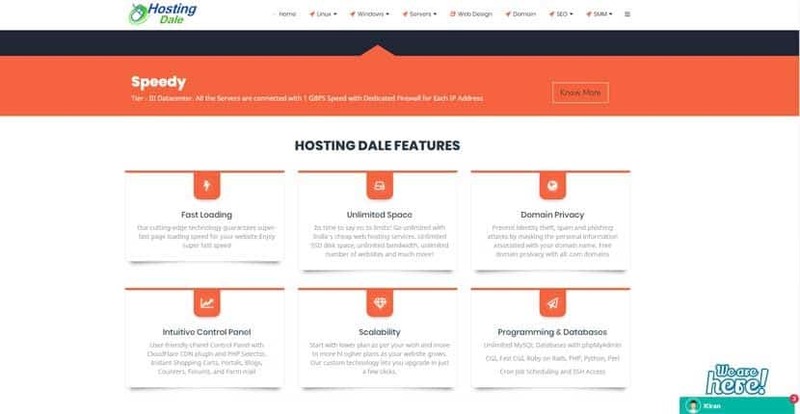 Hosting Dale Review 2019: Is Hosting Dale a Good Hosting? Hosting Dale offers France-based servers at a competitive price point. Free SSL certificates, SSD storage, and web design services make it an excellent choice for beginning webmasters. Hosting Dale is an Indian company offering shared hosting, reseller hosting, self-managed VPS, and dedicated servers for Windows and Linux. It operates servers in France. 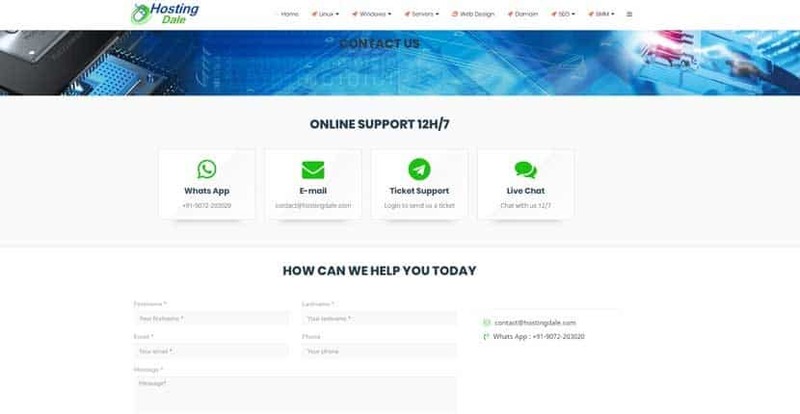 Support is offered in English. Hosting Dale differentiates itself by offering both Linux and Windows plans at price points and capacities suitable for both beginning and advanced webmasters. All Hosting Dale Linux shared hosting plans come with a 99.9% uptime guarantee, though this doesn’t appear to be backed up by a Service Level Agreement. In addition, you’ll get free SSL certificates and a one-click web installer that includes easy integrations of WordPress, Joomla, and Drupal. However, the Hosting Dale website does not mention how many integrations are available in total. As a nice perk, its Windows plans come with a slightly higher uptime guarantee — 99.95%. Once again, however, this doesn’t appear to be backed up by a Service Level Agreement. The prices of the Linux shared hosting plans are very good relative to the competition. Rates are listed in both U.S. dollars and Indian rupees. Overall, Hosting Dale’s distinguishes itself by offering low-cost server packages with excellent functionality. Beginning webmasters running small websites and blogs can get 2GB SSD storage, 5 GB of data transfer, and two MySQL databases for almost nothing. Those specs can be scaled up to unlimited storage, data transfer, and databases, offered at a price that’s just slightly higher than what you’ll pay for much less performance elsewhere. However, the Windows pricing model is not as advantageous. The entry-level plan is priced about average versus competitors and gets you unlimited disk space and bandwidth, with ten MSSQL and ten MySQL databases. But moving up to the mid-tier “standard” plan actually gets you less disk space — 50GB — with unlimited bandwidth, 50 MSSQL, and 20 MySQL databases. And then the highest-tier plan again offers unlimited disk space and data transfer, but decreases the number of databases to 20 MSSQL and 20 MySQL. It almost seems that the team at Hosting Dale hasn’t thought through their packages well. Support options are above average, though nothing stellar. There’s a WhatsApp number that got me an answer in just a few hours, and live chat is available 12 hours a day. Email and ticket options are also available and support staff will generally respond within a day. I found representatives to be knowledgeable and friendly. There is also a self-help knowledge base, but it only answers a few basic questions. Hosting Dale offers excellent Linux shared hosting. Its Windows shared hosting plans and VPS plans offer decent value, but e-commerce merchants will find the mismatch in storage and performance to be problematic, even at a decent price point. Wondering how Hosting Dale stacks up against other Web Hosting companies? Enter any other Web Hosting company and we will give you a side-by-side comparison.